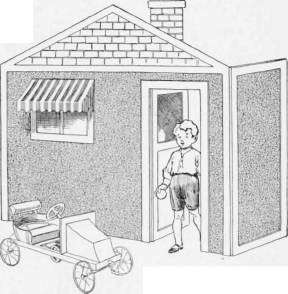 The child's playhouse is an expensive luxury, if it is purchased ready to set up, but by following the instructions given herewith a large and inexpensive one may be constructed. Procure about 100 ft. of 1% by 1 1/2 -in. boards, and saw out pieces, as shown. With the use of iron brackets instead of nails, it will be found much easier to construct than if the corners are mortised and nailed or glued. The frame will also be much stronger. When the frame is completed, burlap is tacked on to make the covering. The burlap can be purchased cheaply, and the best color to use is either green, red or brown. This material should be fastened on the different sections before they are hinged together. To prevent the burlap from unraveling, turn the edges under before tacking them down. A piece of wire screen is used for the door. An old piece will do, if it is well coated with black or dark-green paint. It is then tacked on the inside of the door. Fasten the different parts together with the hinges. The hinges are fastened on the inside of the side wings, and on the outside of the two front pieces. 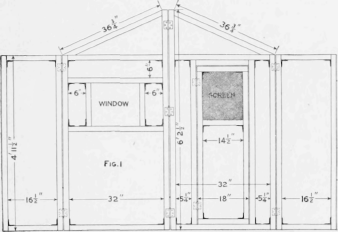 With the hinges placed in this manner, the house can be folded into a small space.